Weymouth is a city in Norfolk County, Massachusetts, United States. As of the 2010 census, Weymouth had a total population of 53,743. The Town of Weymouth is one of fourteen Massachusetts municipalities that have applied for, and been granted, city forms of government but wish to retain "The town of” in their official names. It is named after Weymouth, Dorset, a coastal town in England. It is the second-oldest European settlement in Massachusetts. As of the census of 2010, there were 53,743 people, 22,435 households, and 13,595 families residing in the city. The population density was 3,174.2 people per square mile (1,225.4/km²). There were 22,573 housing units at an average density of 1,327.1 per square mile (512.4/km²). 75% housing units were owner-occupied and 25% of housing units were renter-occupied. The racial makeup of the city was 89.7% White,3.1% Black or African American, 0.2% Native American, 3.2% Asian, 0.0% Pacific Islander, 0.6% from other races, and 1.2% from two or more races. Hispanic or Latino of any race were 2.6% of the population. There were 22,028 households out of which 27.3% had children under the age of 18 living with them, 48.6% were married couples living together, 10.3% had a female householder with no husband present, and 26.8% were non-families, 37% of which were non-family households with residents over 65 years of age. 30.6% of all households were made up of individuals and 11.1% had someone living alone who was 65 years of age or older. The average household size was 2.42 and the average family size was 3.08. In the city the population was spread out with 22.0% under the age of 18, 6.6% from 18 to 24, 32.7% from 25 to 44, 23.4% from 45 to 64, and 15.4% who were 65 years of age or older. The median age was 38 years. For every 100 females there were 90.4 males. For every 100 females age 18 and over, there were 86.3 males. The median income for a household in the city was $41,665, and the median income for a family was $54,083. Males had a median income of $42,497 versus $35,963 for females. The per capita income for the town was $24,976. About 9.1% of families and 9.8% of the population were below the poverty line, including 7.3% of those under age 18 and 7.4% of those age 65 or over. Weymouth has the 10th highest Irish population in the United States, at 33%. Weymouth is located at 42°12′23″N 70°56′45″W﻿ / ﻿42.20639, -70.94583 (42.206458, -70.945919). According to the United States Census Bureau, the city has a total area of 21.6 square miles (56.0 km²), of which, 17.0 square miles (44.1 km²) of it is land and 4.6 square miles (11.9 km²) of it (21.29%) is water. Weymouth contains the Weymouth Back River and the Weymouth Fore River; its surroundings, formerly industrial, are now set aside as parks and natural areas including Webb Memorial State Park. There are also a lot of streets named after people and trees. Weymouth residents often designate which of four distinct 'districts' they live in. North Weymouth is considered anything north of the intersection of Church Street, North Street and Green Street. Some of the sites around North Weymouth are Great Esker Park, George Lane Beach, Webb State Park, the Wessagusset Yacht Club, Boston skyline views, and the Abigail Adams Historical Society. It also includes up and coming waterfront property that rivals similar in pricier towns. South Weymouth is mostly south of Route 3. East Weymouth is somewhat in the center of Weymouth, including Whitman's Pond, Jackson Square, and Town Hall. East Weymouth has several fine examples of Victorian homes, including Queen Anne, shingle, and colonial revival homes. Some particularly fine examples of these homes are being restored on Hillcrest Road. Weymouth Landing spans a mile around Weston Park. Weymouth is bordered on the north by Hingham Bay. Weymouth's territory includes Grape Island, Slate Island, and Sheep Island, all part of the Boston Harbor Islands National Recreation Area. Weymouth is bordered on the west by Quincy, Braintree, and Holbrook. It is bordered on the south by Abington and Rockland. Weymouth is bordered on the east by Hingham. The climate in this area is characterized by hot, humid summers and generally mild to cool winters. According to the Köppen Climate Classification system, Weymouth has a humid subtropical climate, abbreviated "Cfa" on climate maps. Weymouth is served by several MBTA Bus routes as well as three MBTA Commuter Rail stations: two on the Greenbush Line, at Weymouth Landing and near Jackson Square, and one on the Old Colony Line at South Weymouth. Numbered routes that pass through the town include Massachusetts Routes 3, 3A, 18, 53, 58 and 139. Weymouth was Founded in 1635, from the territory known as Wessagusett which was described in 1622—just two years after the Pilgrims landed in Plymouth. Weymouth held the distinction of having the oldest-continuous Town Meeting form of government for 365 years. In 1999, Weymouth residents voted to change to a city form of government. David M. Madden was elected as the city's first mayor and took office in the year 2000. Weymouth is home to one of the youngest councils in the Commonwealth of Massachusetts with four elected officials 35 years or younger. Kevin Whitaker, 35, Victor Pap, 34, Arthur Matthews, 30, and Patrick O'Connor, 25. On July 10, 2007, Mayor David M. Madden announced he would not seek re-election. In 2008, Susan Kay was elected as the new mayor of Weymouth. Weymouth High School is the one high school in Weymouth. Prior to 2005, grades eight and nine were housed in Weymouth Junior High while grades ten, eleven, and twelve comprised the High School. This changed with the construction of a new wing on the Junior High building in South Weymouth, which subsequently became the new Weymouth High School housing grades nine through twelve. The old Weymouth High School in East Weymouth was converted into the Maria Weston Chapman Middle School. More than 2,000 students attend the high school. A brand new athletic surface was completed in 2005, giving Weymouth High School an artificial turf field and a track surface. There is one Weymouth Middle School in East Weymouth.There are two campuses and are down the street from each other. The campuses are called Chapman Campus and Adams Campus. Abigail Adams Middle School has now been set for 5th and 6th grades and Maria Weston Chapman Middle School 7th and 8th grades in 2010. There are eight primary schools and one early childhood center, five of which are named after Weymouth's Congressional Medal of Honor recipients. In addition, there are five private schools in Weymouth. South Shore Christian Academy, an independent, Christian, college preparatory day school for students in grades K-12. SSCA also operates a pre-school program. Saint Jerome Elementary School, a Catholic elementary school for grades Pre K-8. Sacred Heart Elementary School, a Catholic elementary school under the direction of the Archdiocese of Boston for grades Pre K-8. First Baptist Christian, an elementary school for grades Pre K-8, under the direction of the First Baptist Church of Weymouth. St. Francis Xavier, a Catholic elementary school under the direction of St. Francis Parish. The site of Weymouth first saw European inhabitants in 1622 as Wessagusset Colony, a colony founded by Thomas Weston, who had been the main backer of the Plymouth settlement. The settlement was a failure. The sixty men taken from London were ill-prepared for the hardships required for survival. They also may have lacked the motivation of the Pilgrims as this colony was purely economic in motivation and the men had not brought their families. By winter, poor planning and bad management led to supplies running out. With the Plymouth colonists having few supplies to share, the Weymouth men began to steal from the local Massachusetts nation. Foraging in cooperation with the Pilgrims and trading with Natives was insufficient, and some colonists began to steal from the natives. By now, many in the colony were ill and all forms of law and order had broken down. The lowest point came when a healthy settler was caught stealing supplies from the Massachusetts and the Massachusetts leaders demanded the thief's execution; the Weymouth men complied but either executed or failed to substitute for execution a dying, sick settler instead. By April 1623, word of conflict between Native Americans and the Virginia colonists had reached the north and this increased the tension between the two groups. Massachusetts and other native groups began plotting to attack and destroy what was left of the floundering Wessagusset colony and possibly the more successful Plymouth Colony. Massasoit heard about it and sent word to Plymouth. Bradford, fearing that Plymouth would also be destroyed, sent Myles Standish to Weymouth with the Plymouth militia to end the threat. Under a banner of truce Standish lured five of the more bellicose Massachusetts Natives inside the stockade. There, after a brief struggle, the native leaders were killed. Ten of the original sixty had starved to death and two others had been killed in conflict with the Natives. Forty-five colonists went north joined Plymouth or went north to Maine, and from there most returned to England. The three who remained were subsequently killed by Native Americans. Weymouth was heavily involved in the shoemaking industry from the first years of the 18th century right through to 1973, when the Stetson Shoe Company closed its doors. The building is currently being used for medical offices. Five Weymouth citizens have been awarded the Medal of Honor making it the city with most Medal of Honor recipients in the United States: Thomas W. Hamilton, serving in the Civil War; William Seach, serving in the Boxer Rebellion in China; Elden Johnson, serving in World War II; Ralph Talbot, a pilot in World War I; and Frederick C. Murphy, who also served in World War II. Weymouth is home to the house where Abigail Adams, wife of President John Adams and mother to President John Quincy Adams, was born. A portion of the former South Weymouth Naval Air Station, which was closed in 1996 under the Base Realignment and Closure Act, was located in Weymouth. South Weymouth Naval Air Station has been slated for development which will be called South Field. Plans include a parkway, residences, a sports facility and a movie studio. Jim Carey, former professional hockey goaltender from 1994 to 1999 and Vezina trophy winner in 1996. Newland H. Holmes, politician who served as President of the Massachusetts Senate from 1957-1958. Elden H. Johnson, United States Army soldier and a recipient of the United States military's highest decoration — the Medal of Honor — for his actions in World War II. George Little, U.S. Naval Officer, two destroyers have been named USS Little in his honor. Charles G. Long, the second Assistant Commandant of the Marine Corps. He was a recipient of the Marine Corps Brevet Medal. Patrick V. McNamara, Democratic United States Senator (1955–1966) from Michigan. Warren G. Phillips, Inducted into the National Teachers Hall of Fame in 2010. Ralph Talbot, the first United States Marine Corps aviator to be awarded the Medal of Honor — for "exceptionally meritorious service and extraordinary heroism" while attached to Squadron C, U.S. 1st Marine Aviation Force, in France during World War I. 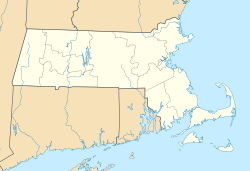 ^ Although it is called the "Town of Weymouth," it is a statutory city of Massachusetts. See Office of the Secretary of the Commonwealth. ^ "Weatherbase.com". Weatherbase. 2013. http://www.weatherbase.com/weather/weather.php3?s=790527&cityname=Weymouth-Massachusetts. Retrieved on October 26, 2013. This page uses content from the English language Wikipedia. The original content was at Weymouth, Massachusetts. The list of authors can be seen in the page history. As with this Familypedia wiki, the content of Wikipedia is available under the Creative Commons License.